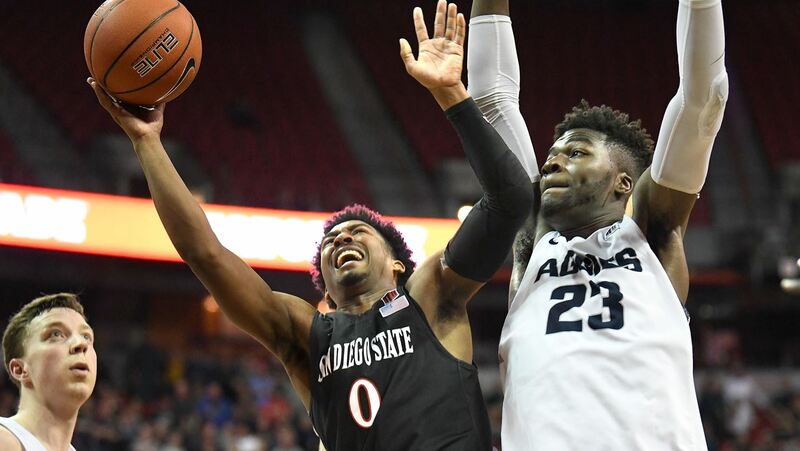 San Diego State’s basketball season came down to just this one game — the Mountain West Conference title game Saturday against Utah State. Win it and the Aztecs go to the Big Dance, lose and their season is over. SDSU needed to win this game, instead, it lost 64-57 to Utah State in Las Vegas. The Aztecs (21-13, 11-7 Mountain West) kept it close in the first half, trading leads with the Aggies seven times and trailed by two points at the half, 34-32. When the second half started, the first 13 points were from Utah State. Merill led the Aggies with 24 points, making 11 of 12 from the free-throw line, and was named tournament MVP. After the Aggies’ 13-0 run, the defending champion San Diego got no closer than five points twice. The last time was in the final minute at 60-55. But Merill nailed four free throws within 31 seconds to seal the deal. Devin Watson led the Aztecs with 18 points, 15 of those points were 3-pointers. Watsons made two of his 5 treys and assisted with Matt Mitchell’s 3-point jumper in the last five minutes of the game after Jalen McDaniels fouled out. San Diego State has reached the NCAA Tournament seven times in the past 10 years, but this will be the third time in four years they won’t be going to the Big Dance. In all likelihood, this will be the end of the season for the Aztecs. They don’t have the stats to be invited to the NIT and Dutcher has said in the past the team won’t participate in third-tier tournaments such the CBI or CIT.